24 N Coalter Street, Staunton. In 1846 the First Presbyterian Church of Staunton built this residence, the birthplace of President Wilson, for use as a manse. Nine years later, the Rev. Joseph R. Wilson, who had come to Virginia in the early 1850's to teach at Hampden-Sydney College, accepted an appointment with the Staunton Church and moved in. He also served as chaplain of nearby Augusta Female Seminary (later Mary Baldwin College). On December 28, 1856, his wife Jessie gave birth to their first son and third child, Woodrow. About a year later, however, Reverend Wilson took a pulpit in Augusta, Ga., and relocated there with his family. In December 1912, after his election to the Presidency, Woodrow returned to Staunton and spent a night in his birthplace; he had visited the town frequently as a youth. Pastors succeeding the Reverend Wilson used the manse until 1929, when the church deeded it to Mary Baldwin College. The college retained title until about 1938, and then transferred the property to the Woodrow Wilson Birthplace Foundation, Inc., which now owns and administers it. 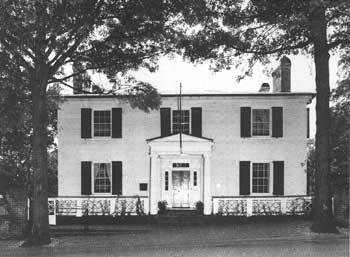 The rectangular brick structure, painted white, represents the Greek Revival style. It sits on the slope of a steep hill. Because the ground floor is below street level on the street side, the house presents two stories on that side and three at the rear. The rooms number 12; four, divided by a wide central hall, are on each level. Architectural features of interest include the one-story, pedimented portico that covers the central entrance on the street side and a wider and more impressive rear three-story portico with huge Doric columns and double balcony overlooking a terraced Victorian garden. The garden, created in 1933 by the Garden Club of Virginia, features brick walkways and bow-knot flower beds bordered in century-old boxwood. One of the walkways leads to a garage, in which is displayed a Pierce Arrow automobile that Wilson used while in the White House and during his last years. Beyond the garden in the distance stands the church where Wilson's father preached and where in 1857 Wilson was baptized. Today it serves as the chapel for Mary Baldwin College. The house contains many Wilson family possessions. Among those on display are the family Bible, in which Reverend Wilson recorded Woodrow's birth; the bookcase the youth bought with his first earned money and used while a student at the University of Virginia; personal letters; items of furniture that belonged to his parents, among which is the cradle he occupied as an infant; furniture owned by Wilson himself, including the canopied four poster bed he slept in while he was president of Princeton University; and musical instruments belonging to him and members of his family. Mrs. Edith Wilson, the President's widow, and associates and friends assisted in furnishing the structure.